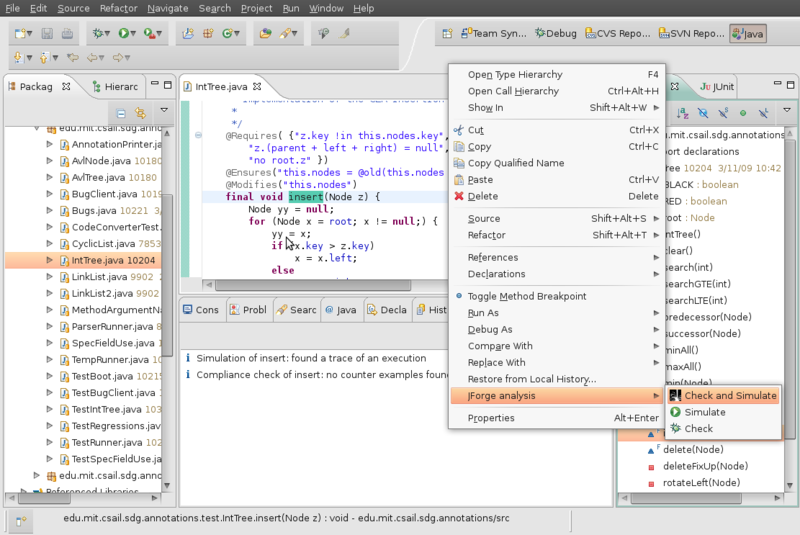 JForge is an Eclipse plug-in for bounded verification of Java programs using Forge. It assists in writing specifications in JForge Specification Language (JFSL) and verifies code against these specifications within bounds specified by the user. In short, JFSL evolved from our understanding of shortcomings of Java Modeling Language in bounded code verification and realization that Alloy-like expression syntax is very efficient in specifying program behavior. The following is an annotated implementation of a red-black tree with integer keys: see code. On Eclipse 3.5 you may need to uncheck Group items by category. Ignore all the warnings about unsigned content. 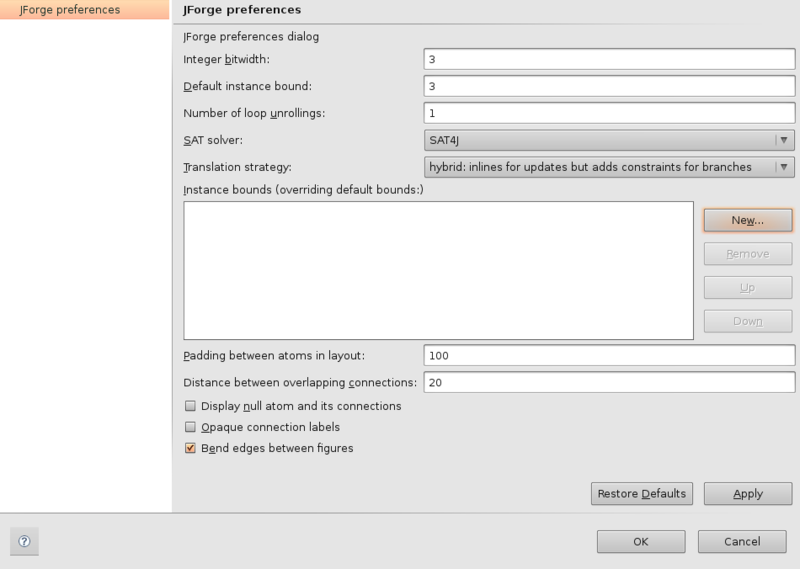 Once the plug-in is installed, you can activate it by selecting Add/remove JForge library in the context menu of a Java project. Toggling JForge nature modifies the build path of the project by adding annotations.jar that contains annotation classes. Toggling twice restores the original build path. 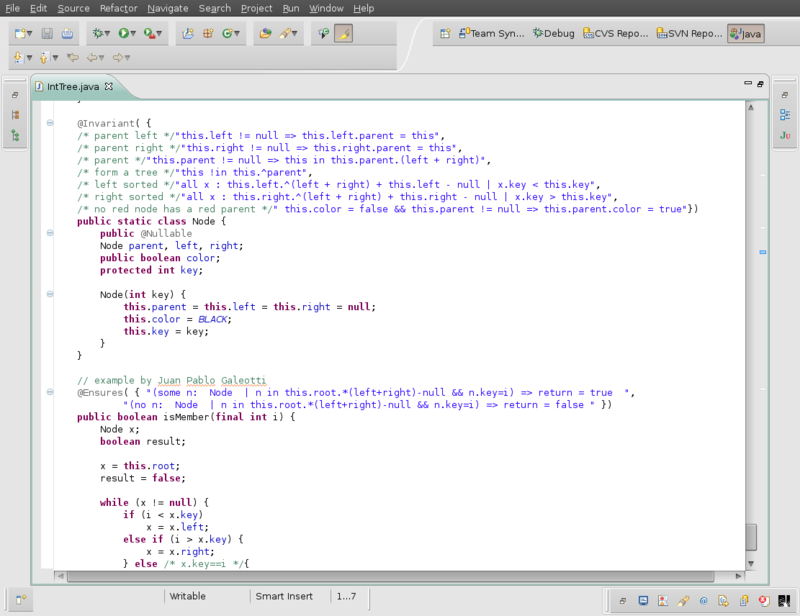 To see the plug-in in action, open any annotated Java class such as the example above. In the outline view, right-click on any method and select JForge analysis → Check and simulate. 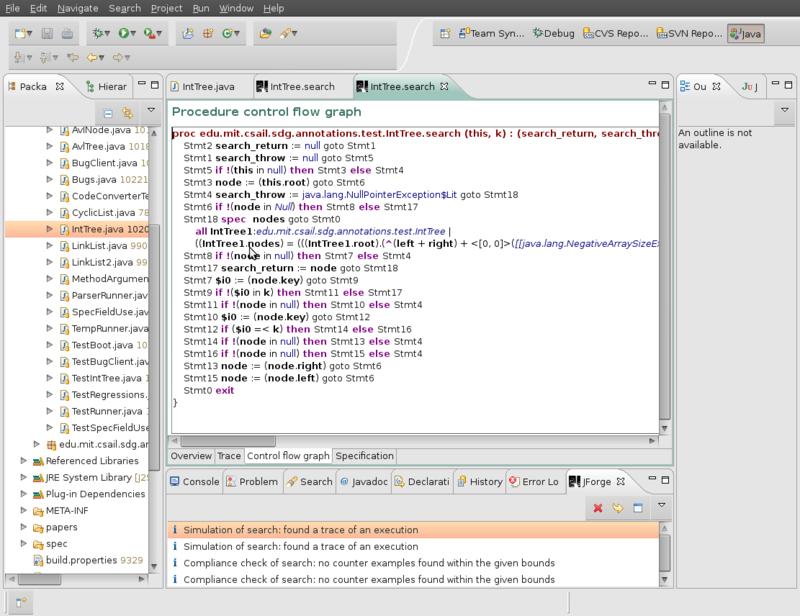 In a few seconds, JForge reports its findings in a new view titled JForge. The results are organized in a succession of result items, which indicate success, a counter example, or an error. You can see details for an item by double clicking on it. You may want to consult Forge site for more information about translation to verification conditions expressed in Kodkod logic. The reference manual for the specification language is included in this thesis. Please contact Kuat Yessenov if you have any further questions. Yes, the links to the source code of JForge plug-in are on the main page. 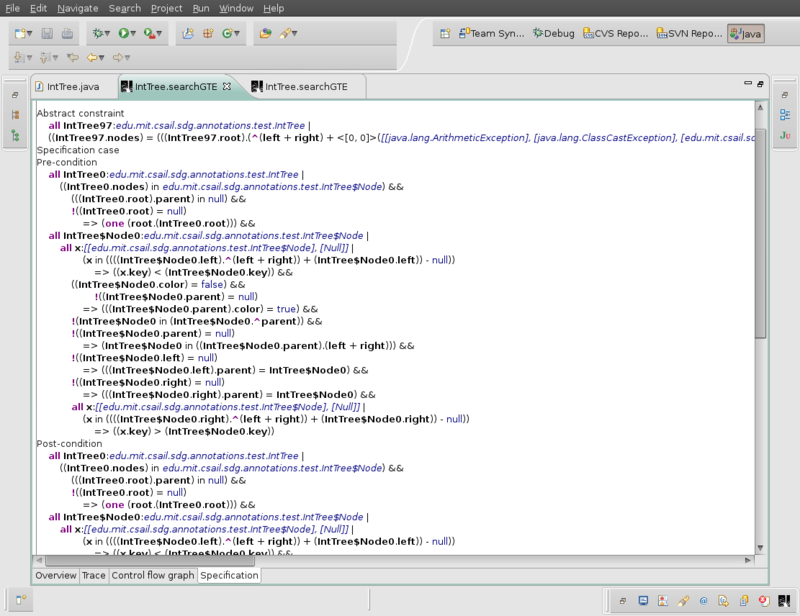 The code is structured in such a way that you can use its headless back-end independently of Eclipse infrastructure. How do I use MiniSat and other SAT libraries instead of default SAT4J? How do I specify a frame condition for an array? You should use expression a.elems in the @Modifies clause. elems is a special field of arrays that evaluates to a binary relation from the integer domain to the base type of the array. This is a special (virtual) throwable class that indicates a failure to satisfy the pre-condition of a called method. What are the translation strategies in Forge (inline, constraint, and hybrid)? These are explained in detail in Greg's thesis. "Hybrid" strategy produces the best average performance from our experience. Depending on the strategy, you may obtain different coverage information as well. Please report. We also welcome any contributors that find the idea of using SAT for finding bugs in Java code with modular full functional specs plausible. The tool has rough corners in handling all real-world code. It can also benefit a lot from heuristics and low-level optimizations to SAT translation. Preferences for a finer analysis, such as integer bit width, custom instance bounds, number of loop unrollings, translation strategy, and choice of SAT library. These are accessible via Options toolbar button in JForge report view or in the global Eclipse preferences dialog. 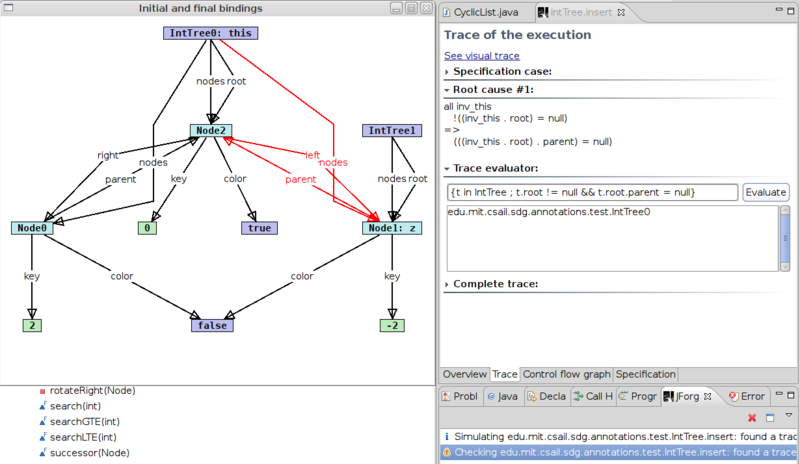 The trace tab also provides an evaluator of specification expressions in the counter example heap. The expression language is the same as of JFSL. 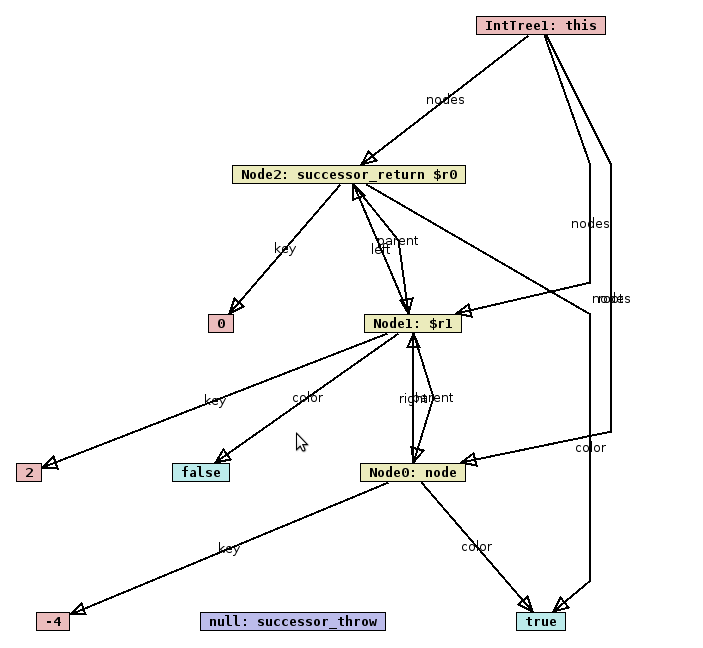 This is a fast and convenient way to navigate in the trace heap. Root cause of specification violation is the sub-expression of the specification that causes it to be false. Usually, this analysis helps to pinpoint a single violated clause in the specification. JFG files contain specifications for binary code for which source code is either not accessible or is not easily modifiable. Examples are supplied with the plug-in. Added support for pure method calls in specifications. Change in semantics of specification fields. User should now provide a frame in declaration of a constrained specification field. See examples. @Helper annotation is correctly interpreted now. Java switch statement support. Invariants are added to pre- and post-states. Various bug fixes. Unconstrained specification fields for collections. Remainder operator support. Java 5 compatibility. Please reset the options for the new instance domain bounds preference to work. Bug fixes. JFG specification format.